Our site\’s registration area requires customers to supply contact information, such as and e-mail address. We use this information to send you promotional materials from our company and from some of our partners. However, users may opt out of € or opt in to € these promotional e-mail messages at any time. (See Opt Out/Opt In, below.) We are opposed to spam, and are joining the challenge to obliterate it. We also collect demographic and profile data that we use to tailor your experience at Winstuff.co.nz. Based on this information, we display products and content we feel you might interest you. Winstuff.co.nz features security measures to protect the loss, misuse or alteration of information placed under our control. Winstuff.co.nz allows users to opt out of receiving e-mail from us or our partners. To opt out of our mailing list you can send e-mail to a remove mailing list or click on http://www.Winstuff.co.nz, enter your email address, and then complete the form. Winstuff.co.nz allows you to change or modify your personal information by sending e-mail to a remove e-mail address or by visiting http://www.Winstuff.co.nz. It is up to you, once subscribed, to edit your subscription, or notify us of same. Winstuff.co.nz can accept no responsibility for third parties subscribing your email address to our database. 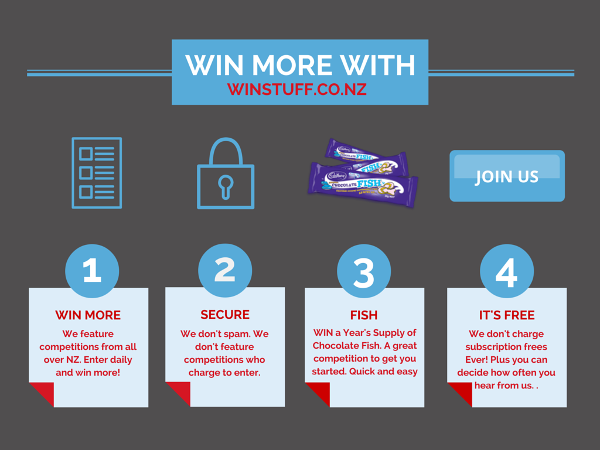 Should you receive an email from us and are not sure if you subscribed, or with to stop receiving further emails, please visit http://www.Winstuff.co.nz and cancel your subscription with us. This site and our ezines contain links to other sites. Winstuff.co.nz is not responsible for the content or privacy practices of these sites.